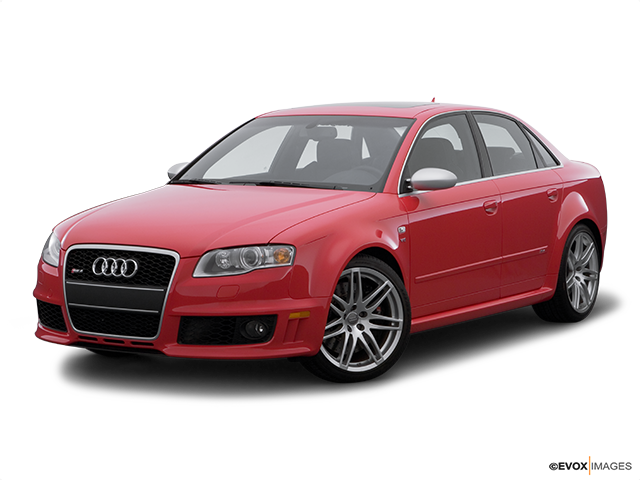 Audi RS4: A sportily configured compact executive car. Equipped with a 2.7 L V6 engine. Originating in 1999, the Audi RS4 came with a sportier more aerodynamic exterior, placing it at the top of the Audi compact lineup. The latest Audi RS4 delivers all you expect from a 4.2L, V8, and 400 horsepower engine with a torque of 317 lb-ft. The RS4 comes standard with a 6-speed manual transmission only. The Audi Quattro all-wheel-drive system ensures this powerhouse maintains its adhesive contact with the road surface as car and driver combine for an amazing experience. Support is given by specific suspension tuning with Dynamic Ride Control, as well as upgraded all-wheel-drive components, and added brake performance. With designer 48-centimetre wheels and high-performance tires, the Audi RS4 is also identified by an aggressive exterior styling, which includes flared fenders and an original deck lid spoiler. Combined, this exterior projects the visual message that this is a car with a latent performance potential and cannot be ignored! Heated leather sport seats and dual-zone automatic climate control are standard features of the RS4. The overall design of the cabin is more practical than opulent. The sport seats look good and are very comfortable. For the front people there is plenty of room but for those passengers sitting in the back, the space is rather limited. Black appears to be the favoured colour by Audi for the RS4 interior, but you can have light-coloured leather for the seats and door panels and the dashboard and centre console in grey carbon trim. As well, there is the option of a honeycomb pattern for the seating. There is a leather-wrapped steering wheel that comes with white stitching and an RS badge, which is also seen on the shift gate and door sills. Featured on the instrument cluster display are tire pressure and torque. For those people who want Audi's outstanding Virtual Cockpit digital display system, it is an available option. For 2018, the 4.2-Litre engine is going to be dropped in favour of a twin-turbocharged 3.0-Litre V6 engine producing over 450 horsepower. With this system combined with Audi's famous Quattro all-wheel-drive system, the Audi RS4 will certainly be a worthy competitor in its segment. There is also talk that together with a downsized engine, the RS4 may be equipped with an electric turbo-charging technology feature that offers near-instant throttle action from low revs and eliminates the lag related to high-powered turbocharged engines.